Andrey Karpov (3rd left) at RCSC in New Delhi. 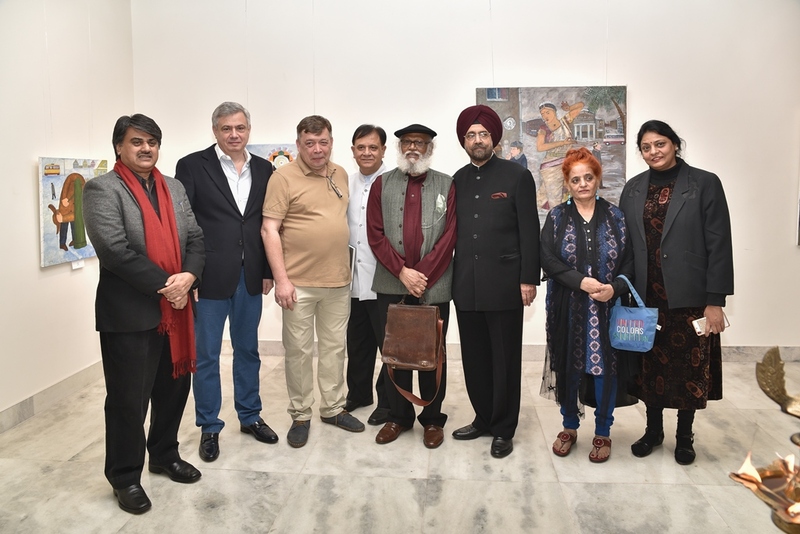 An exhibition of art works, ‘Russia and India – Penetration of Cultures,’ by Andrey Karpov, symbolising cultural affinities between the two countries opened at the Russian Centre of Science and Culture in New Delhi on December 6. The people of Delhi got to see a unique Exhibition of Art Works by eminent Russian artist Andrey Karpov, entitled “Russia and India – Penetration of Cultures,” which is symbolic of the close cultural affinity between the two countries. An eloquent expression of Indian life, art and culture, tradition, religion and architecture, environment and scenic beauty constituted the primary theme of the Russian artist in the art works on display at the exhibition. Karpov is among those who have declared their love for the Indian civilization. The exhibition opened at the Russian Centre of Science and Culture (RCSC) in New Delhi on December 6, 2016, to mark the 70th Anniversary of the Establishment of the Diplomatic Relations between Russia and India. It will remain open for viewing until December 23. Karpov and his wife Elena Adamova were present on the occasion. Among those participating in the inaugural ceremony were comprised Sudhakar Sharma, Secretary, Lalit Kala Akademi, noted Indian artist Jatin Das, Tripat K. Kalra, Director, Nvya Art Gallery, Major Dalbir Singh, Secretary, AICC, Surjit Akre, Chairman, Roerich Art Club, RCSC, Sergey Karmalito, Senior Counsellor, Russian Embassy in India, and Fedor Rozovskiy, Director, RCSC. An elite gathering comprising artists, art-lovers, art critics, parliamentarians, teachers, students, Russian compatriots, mediapersons and others attended the colourful event. Chief guest Sudhakar Sharma lauded the role played by the RCSC in bringing precious art works of Russian geniuses like Karpov, and strengthening of cultural relations between India and Russia. Laying emphasis on the well-timed organisation of such a significant exhibition of art works by a prominent Russian artist, Karmalito referred to the series of cultural events to be held at the RCSC to mark the celebration of the historic 70th Anniversary of establishment of diplomatic relations between Russia and India. He underscored the spiritual and philosophical inclination evident in the art works testifying the artistic instinct of Karpov. Karpov, who lives in Moscow and graduated from the Moscow Institute of Physics and Technology, has been working for more than 30 years. He has mastered various painting and graphic techniques, illustrated books, made porcelain and ceramic plates, tile murals and carpets. Called “intellectually naive” by art critics, there is a lot of humour and warm-heartedness in his multi-figure compositions. His ironical and paradoxical paintings are popular among gallery-owners, collectors and trade-buyers world-wide. His works are housed in various foundations, corporate and private collections in various countries across the world.